During the 2018-19 school year P.S. 290 will host a Spring Gala Live and Silent Auction that is attended by hundreds of parents, faculty and friends of our school as well as a Fall Camps Only Online Auction. 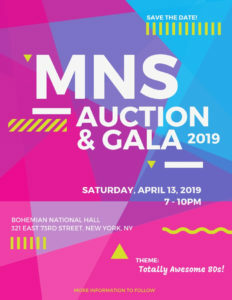 Join your MNS Friends on Saturday, April 13 from 7-10pm at the Bohemian National Hall (321 E 73rd) for a fabulous evening of cocktails, food and your favorite 80's tunes! Purchase your tickets today! Tickets cost $120/person until April 12. Tickets purchased at the door will increase. Please email auction@mnspta.org if you have any questions!